With home improvement being a big business around the world, homeowners are renovating regularly to improve their home's value. While periodic renovations do improve overall value, a glass balustrade will go the extra mile to further add value. From balconies to patios to pool-sides and stairways, these balustrades add sophistication and elegance to your home. With variations in glass and plain or patterned glass to choose from, there is no limit to creativity. When glass is used as a balustrade, it is known as structural glass. These balustrades do more than just make your house look attractive – they also define limitations and hold the rest of your balustrade together. You can choose from different types of glass balustrades, such as those that feature metal, wood or glass for a more modern appearance. Since glass takes on the theme of the room, it works perfectly well for sophisticated or even rustic homes. When you think of glass, the first thing that may probably come to your mind is that of its shattering. Therefore, the concept of using a glass balustrade for your house may seem a bit hard to accept. But these balustrades are secure, sustainable and durable. High quality glass that is fitted well is a sensible option for your indoor or outdoor stairways and is perfectly safe. When used indoors, they create the illusion of extra space and help let natural light flow through your room. They work beautifully with bespoke stairways or wooden stairways and blend perfectly with any indoor theme. Glass balustrades are not just cost-effective, but are weather proof as well. When used as fencing around a pool, you’re adding to its security while being able to see what is happening in and around the pool. It is flexible, practical and blends beautifully with your surroundings. This stands true for outdoor spaces such as porches too. Since glass is increasingly more resistant to weather conditions and to heat, using glass for porch balustrades lets you take your outdoor space to a whole new level. Complement them with solid stainless steel or wood for added durability and lean on them in confidence when you’re relaxing with friends or family. Modern times have seen the introduction of etched glass balustrade to increase a home’s overall aesthetic appeal. It is perfect for indoors as it gives you the benefit of art within your home, along with the durability of structural glass. The malleable elegance of glass and the virtually unending customizations that are possible with it make it a perfect candidate to enhance your home’s attractiveness. 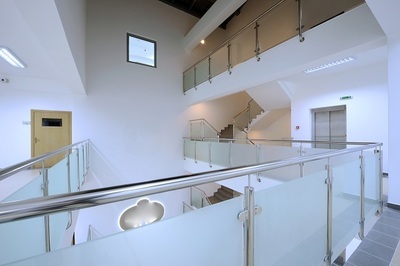 When used indoors, glass balustrades need little maintenance to keep them dust free and as good as ever. But for outdoors they require regular maintenance to keep them looking good. Pool-side glass, needs proper care to keep it free of water marks. Despite the maintenance, though, choosing glass as an option for your balustrades is smart and can work well. 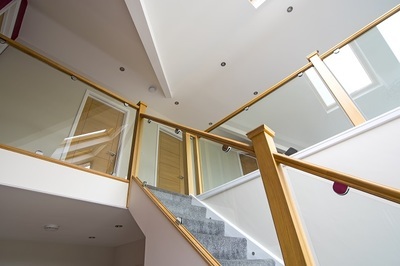 In summary, glass balustrades are ideal for any home – old or new. Irrespective of whether you’re remodeling to hike your home’s value or simply love your home and want to make it look attractive, using glass for your balustrades, both indoor and outdoor, can enhance its visual and functional appeal. Use plain glass with wood or steel for a contemporary finish, or choose etched glass for your indoors for a touch of art within your home. They go well with any theme, and enhance a home’s market value.